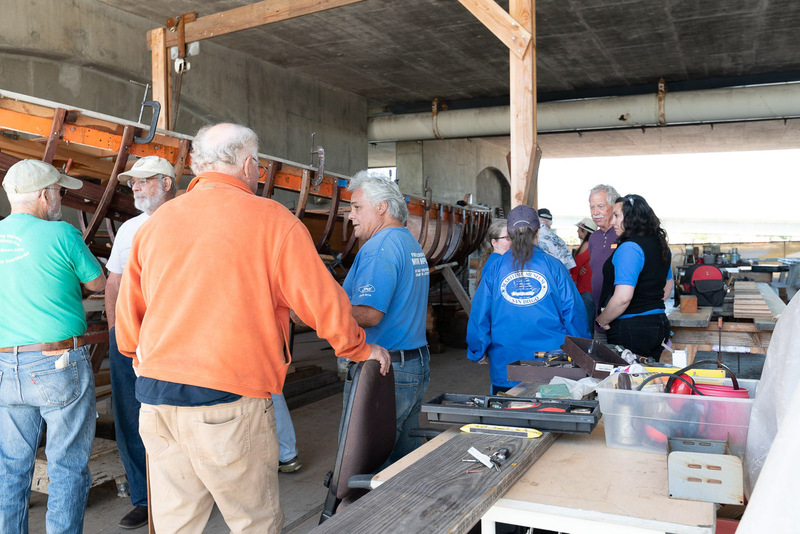 Supporters including volunteers, donors, and staff of our Butcher Boy reconstruction project celebrated progress made so far down on the build site at Spanish Landing. On March 22nd, MMSD hosted a picnic celebration full of sandwiches, fruit, veggie platters, cookies, and drinks. Thank you to all those that came out on a beautiful sunny afternoon! The Butcher Boy has come a long way this year! 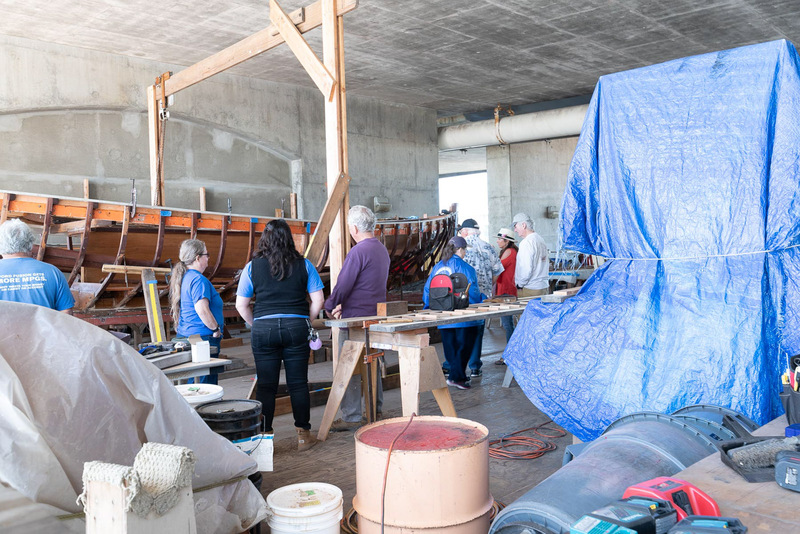 Such a long way, that to some it may appear that MMSD staff and volunteers have actually started building a brand new boat from scratch once again at Spanish Landing. All of Butcher Boy’s frames have been replaced, and twenty-seven pairs of ribs have been built out of laminated sapele wood. There is a brand new Bow Stern, Stern Post, and the deck planking has been milled. Currently, the deck beams are being redone. The Butcher Boy boys are fairing now, making all the ribs smooth. 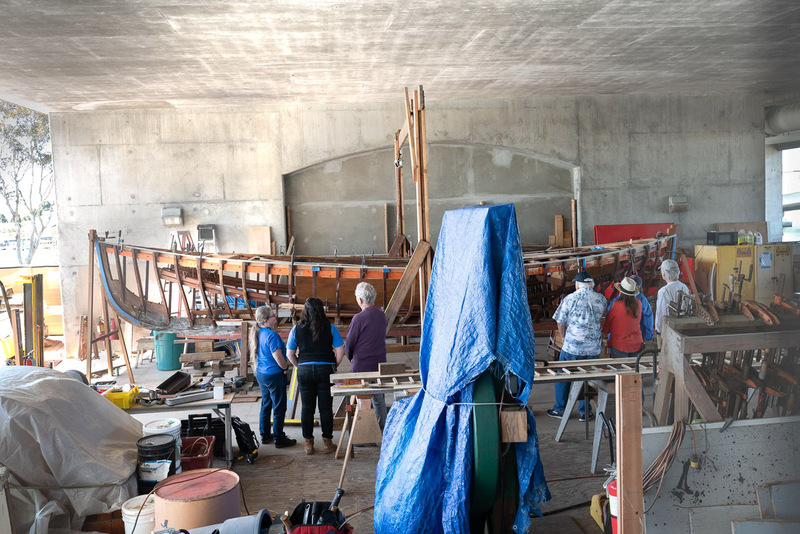 Peter Wilson, Maintenance Director and Master Shipwright, is impressed by the project’s progress. Next steps for 2019 include fiber glassing the centerboards and starting to plank. 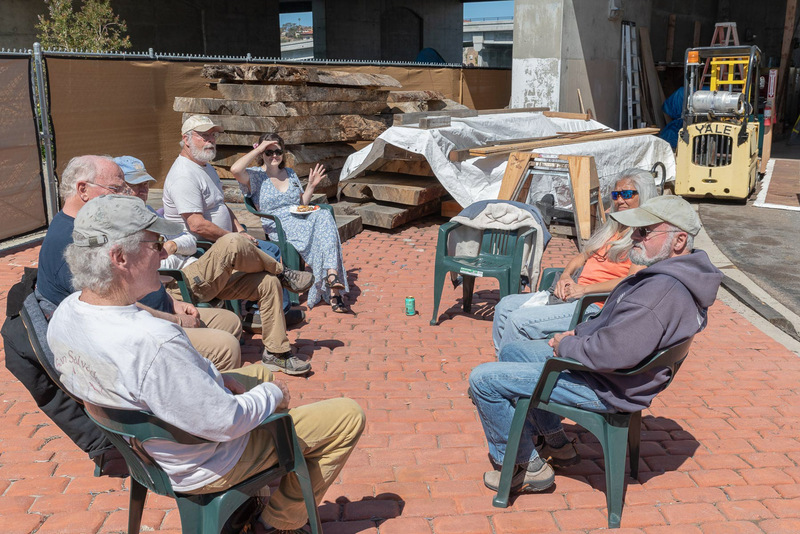 Volunteers are welcome to join Steve Kessler, Bill Fisher, John Martin, and Tim Stephens at the build site under the bridge in Spanish Landing Monday through Friday. 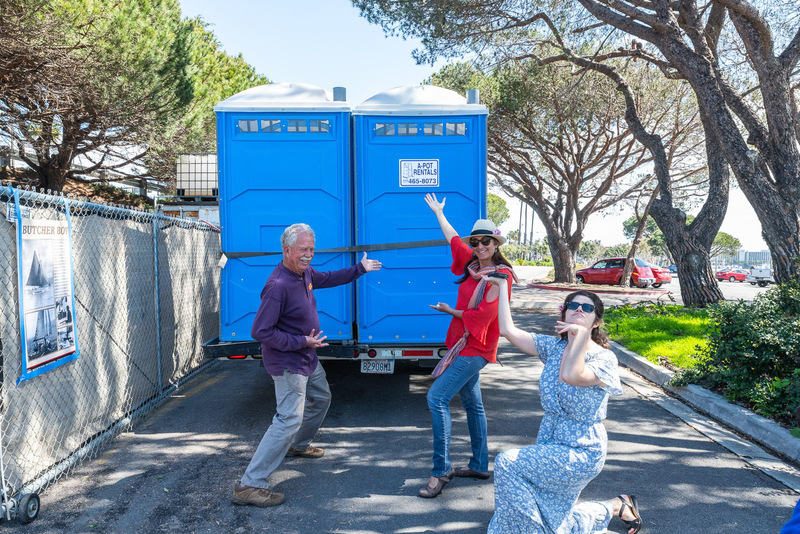 Please contact Peter Wilson at 619-234-9153 X114 if you are interested in volunteering on this project. Rumor has it those who volunteer may be those first to sail her once again. 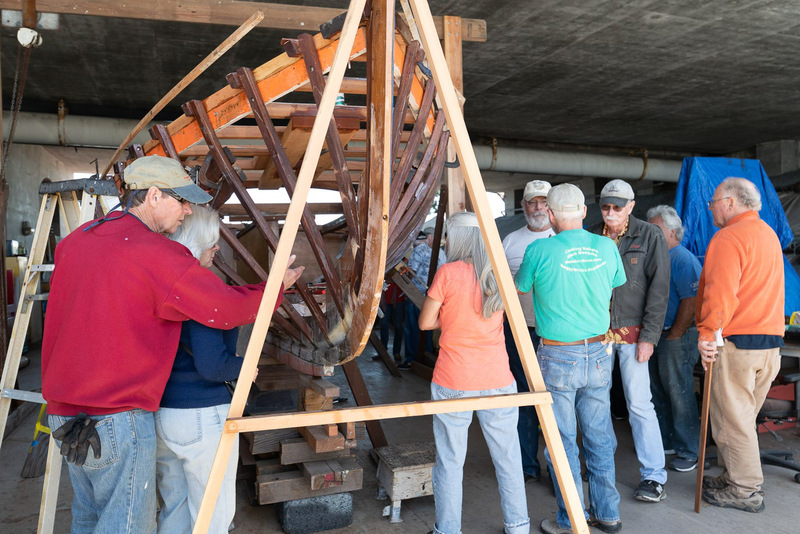 A small team has been working slowly and carefully to reframe Butcher Boy’s hull. Thirty of the fifty eight frames have replaced so far. A new stern post and stem have also been constructed and are ready to be installed. 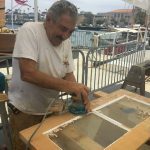 Creating new frames: After cutting Sapele wood into long, 1/8″ thick strips, the restoration crew uses epoxy to laminate them together into pliable 1x1inch frames. 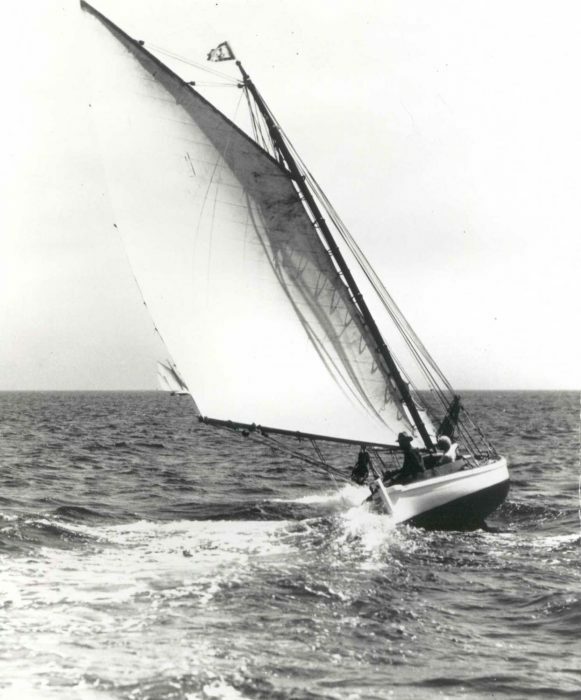 While the piece is still wet, it is placed one end in the heel of the keel and then bent up the inside to match the planks, clamping the flexible strip in place at each touch point. It stays clamped until it is cured and hardened into the proper shape. 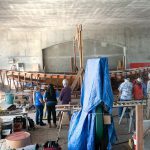 Once shaped to support the contours of the hull it is removed, sanded off to remove any uneven epoxy and routed to round sharp edges. Finally the finished piece is reinserted and screwed in. The freshly epoxied piece is wrapped in blue plastic to keep it from curing until it is bent in place. Dr. Bill Fischer and Tim Stephens work as a team to bend and clamp frames. Bucher Boy with new frames projecting up above the plane of the deck. Looking through the hull, bow to stern at the exposed frames. Thanks to the dedicated efforts of Jeff Saar, Bill and Tim she is slowly and carefully coming together. One by one they have made and installed another thirty of her fifty four frames. Only a few more frames can be added before the Stern and Stem Posts need to go in. We appreciate your investment in Butcher Boy’s restoration and look forward to getting her back out to sea! As you have provided the funds needed, we are now applying the knowledge and planning that rebuilding/restoration requires. Last month Butcher Boy was carefully lifted and trucked over to Spanish Landing. Lumber for her hull has been acquired and the build site work area cleared and prepared. 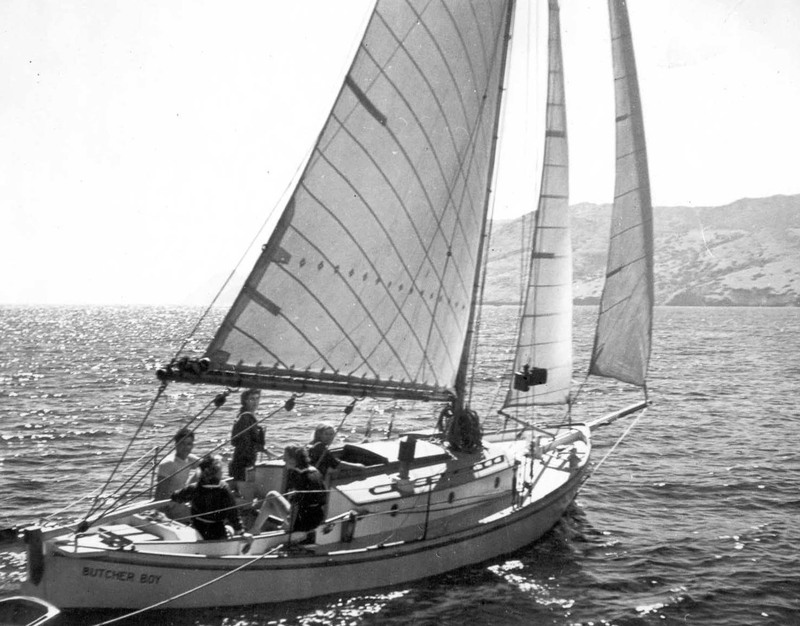 A team of shipwrights has assembled and they are into the first very important stages of the project. The arduous task of measurement and transcription that allows a three-dimensional object to be translated into a two-dimensional one, known as “taking the lines off,” was a necessary first step. Now that plans have been drawn that reflect her present state, they can be compared with those in the past. 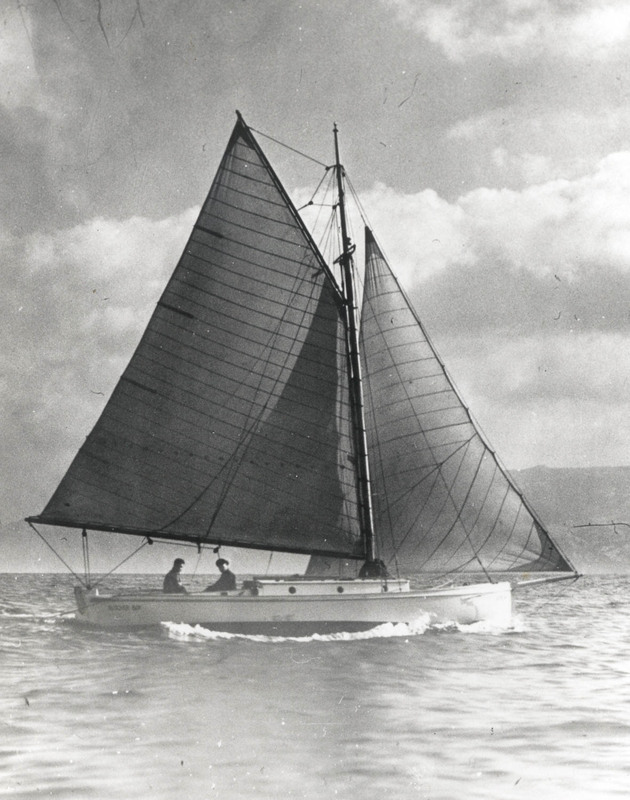 Because Butcher Boy has been out of the water more in the last 40 years than in it, we expect that her hull has been seriously distorted by the pressures that cradling, gravity and age assert. We want to make sure that these changes are accounted for and we are not recreating problems as we restore her. We are grateful for the wisdom and hard work of Steve Kessler who has just completed lofting. This detailed operation is essentially a process of drawing out the designer’s lines in full size and in three dimensions. This is done by means of contours which define the hull shape in exactly the same way that the contours on a chart define the shape of the sea bottom or a contour map of the land. This helps to assure that the boat will be accurate in its layout and in appearance. Much of our planning is now complete and we can move forward into construction in the New Year. Thank you for keeping Butcher Boy alive. We will keep updating you on her progress. 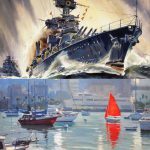 The Maritime Museum of San Diego enjoys a worldwide reputation for excellence in restoring, maintaining and operating historic vessels. The museum has one of the world’s finest collections of historic ships, including the world’s oldest active sailing ship, the Star of India. Maritime Museum of San Diego is a 501c3 non-profit organization. 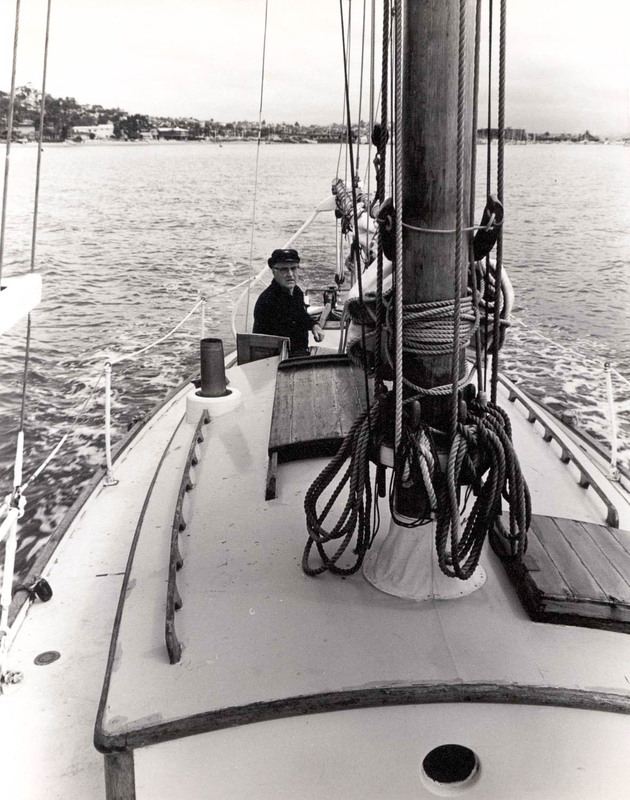 The museum is located at Star of India Wharf in downtown San Diego at 1492 North Harbor Drive, San Diego, CA 92101. 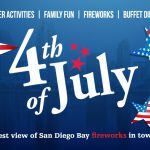 The telephone number for general inquires is 619.234.9153 ext 101.